I’ll just jump right into it…the sushi at Wow Sushi is fantastic. I heard it was something I needed to try, so I gave it a shot and it’s now one of my favorite sushi places. The unique combinations at Wow Sushi make it difficult to choose, but luckily, the menus are very helpful. There is a text version menu with the dry erase marker for ordering, and then to help out, there is a picture menu that shows what each dish listed on the text menu looks like. I found that this helped me narrow down what I wanted to get because seeing the pictures helps me see how it’s prepared which has a lot to do with it for me. Wow Sushi has many great sushi rolls to try, such as the Dynamite roll – cucumber roll with crab on top and spicy sauce; the Smoky roll – smoked salmon, crab, egg, cheese, crunch and spicy sauce on top; and the Rock ‘n Roll – tempura shrimp, crab stick and avocado topped with spicy sauce. These were the rolls I tried, and I couldn’t pick a favorite. And, yes, I ate all three, by myself. Wow Sushi also offers special rolls like the Michigan Roll – spicy tuna, cucumber, avocado and crunch on top; the Lady Dragon – tempura shrimp, crab stick, with tuna on top; and the Spider Roll – soft shell crab, avocado, cucumber, crab stick and masago. In addition to sushi, Wow Sushi also offers appetizers – fried Soft Shell Crab with ponzu sauce, Shrimp Tempura, Sashimi Sampler…; soups and salads; and entrees like the Bento Box, roll combinations, teriyaki dishes, and more. If dining in at Wow Sushi, you are served a cucumber salad with vinegar sauce sprinkled with sesame seeds to start. The salad is fresh and tasty. 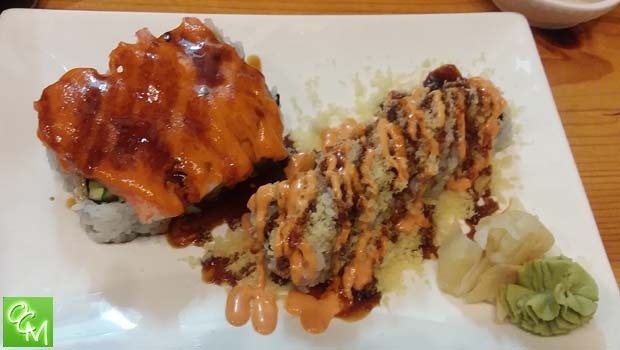 Wow Sushi Troy is allergy conscious and offers gluten free soy sauce, and they are knowledgeable and accommodating if you need to make substitutions or eliminations with your order. For example, I opted for no cheese in the Smoky roll and it worked out great. Dining in at Wow Sushi is not the greatest option. It’s a bit dated and rough inside. I sat at the sushi bar, but it was not like some of the sushi bars I’ve seen that are modern and fun, and have you wanting to sit there. There’s not much inside Wow Sushi that is so inviting where you’d want to eat in. I think I’d rather just do take out. But, that may be just me…seeing that it was pretty full at 7:30p on a Saturday.